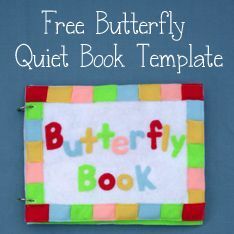 Today's innovative quiet book comes to us from Kate, a writer and book reviewer who writes the blog Blondie Marie. 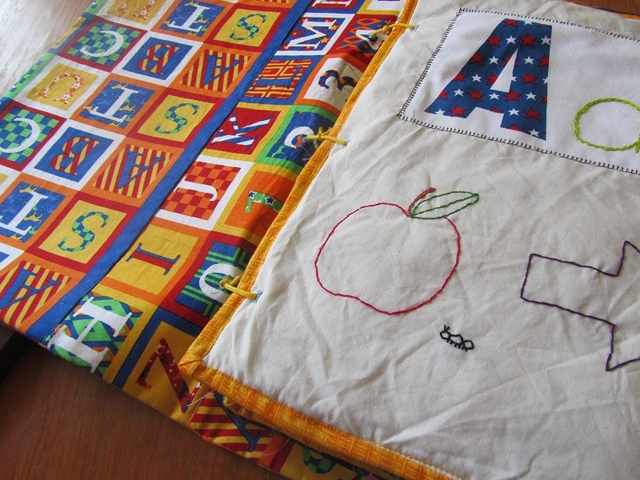 She made this roll-up quiet book mat for her son. 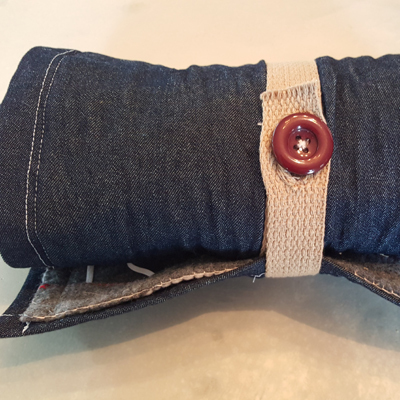 The four pages are sewn side by side with a denim backing, and they can all be rolled up together and closed with a button. It's such a cute book and a great idea; I especially love all the animals that are hiding behind the doors of the barn! All of the pages look very fun and interactive. My name is Kate, and I am a writer, blogger and book reviewer living in northwest Iowa. 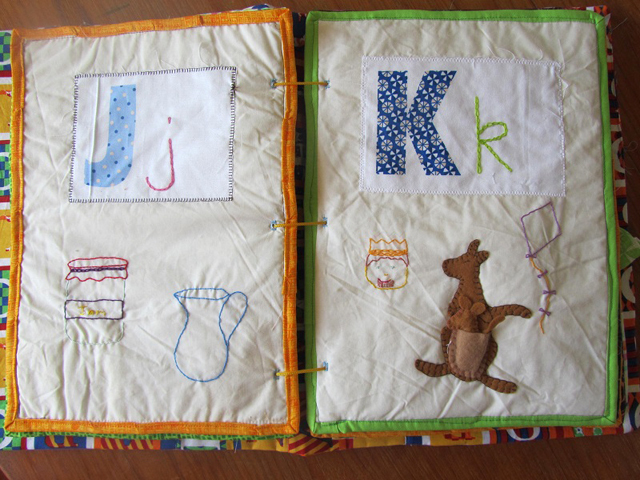 I made this book (mat) for my son, Emmett. He's one year old now, but I'm hoping this can carry him through a few stages. Intermediate to mildly advanced. I think the mat stayed beginner-to-intermediate. I spent about a month on it, working a few hours here and there. Total? Maybe 40? I'm not entirely sure. The farm scene by far took the most time. Most of the other ones I could knock out in a couple of hours. Yes! The lion I took from Sunshine, Lollipops and Rainbows, and I also used her barn template as the basis for my barn. The animals I found the basis for on another website, but I can't remember which one. I altered those patterns too, though. 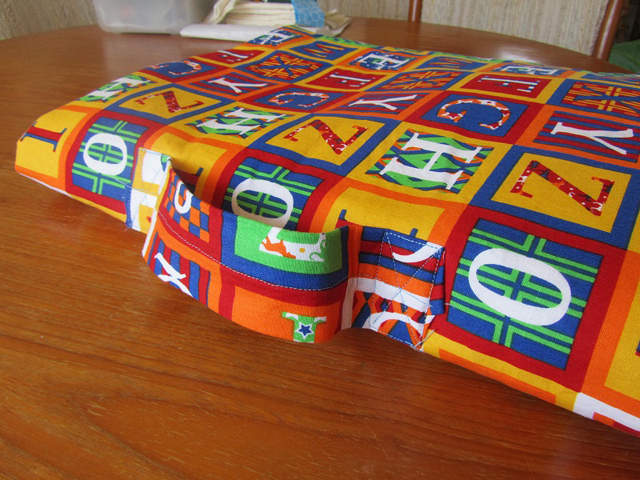 I went roll-up-mat-style with a button and button-hole closure. Felt. 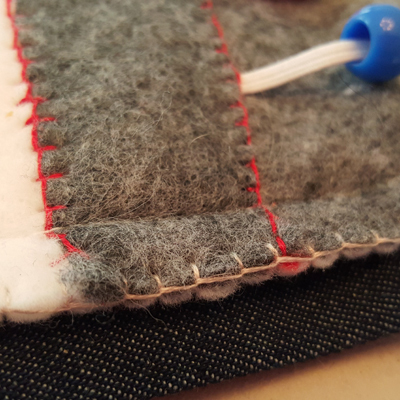 The backing is a denim-type fabric I had on hand. 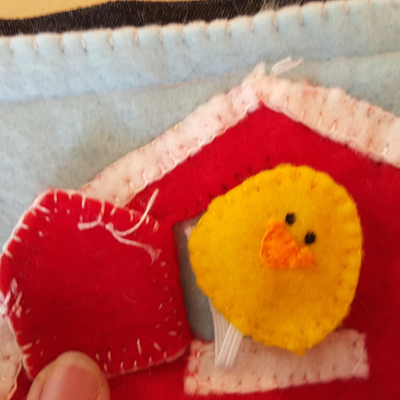 There's also a layer of felt between the panels and the backing, for a little added thickness. 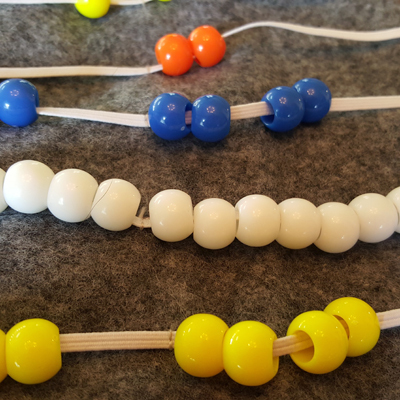 Ribbon for the lion panel, elastic for the farm scene and the bead panels and Velcro for the farm scene and color squares panels. The stitching is all in floss. I used a strap along the backing as well, and a button to close. How much did all of the supplies cost you? About $40, but I have a lot felt, floss, Velcro and beads left over that I can use on other projects. I should say the farm scene because it definitely has the most blood, sweat and tears in it. But I love the color squares page, because I like the simplicity and the challenge for Emmett to match the swatches to the colors on the panel. Kate, thank you so much for sharing your awesome quiet book with us! 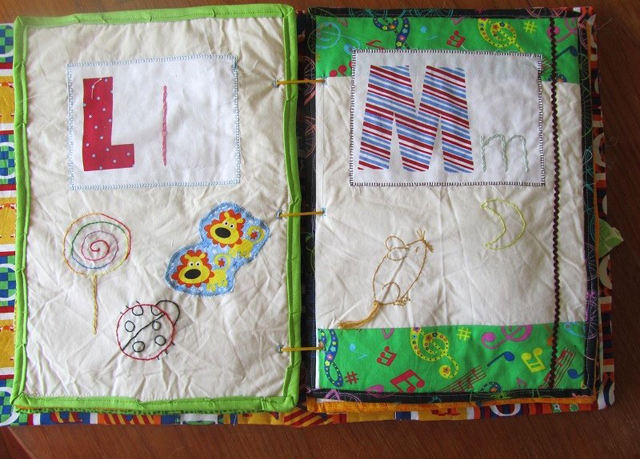 Today's fantastic quiet book was made by mom Paula, who writes the blog "Making it up as I go." 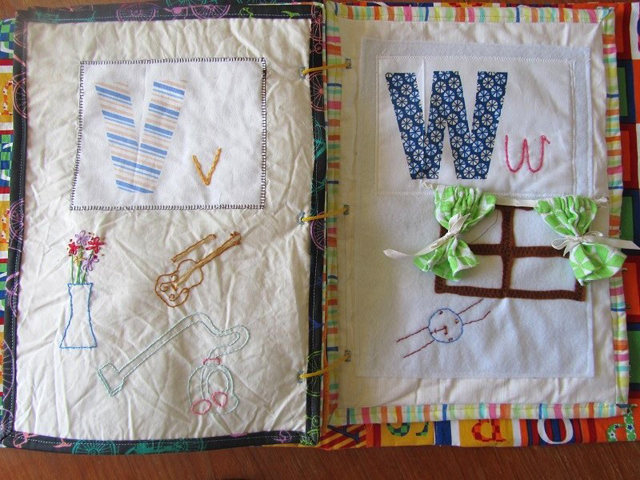 She sewed pages for every single letter of the alphabet to help her girls learn their letters. 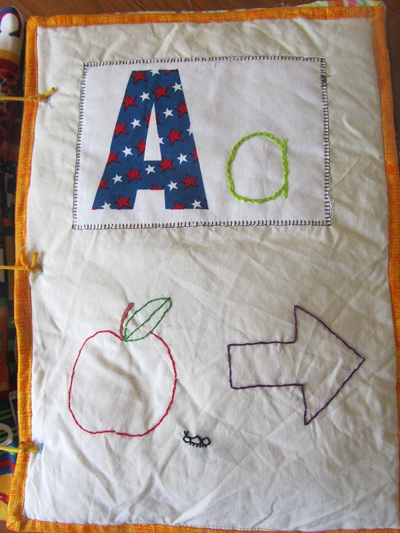 Each page has the letter and several different items that start with that letter - for example, the "A" page has an embroidered apple, arrow, and ant. 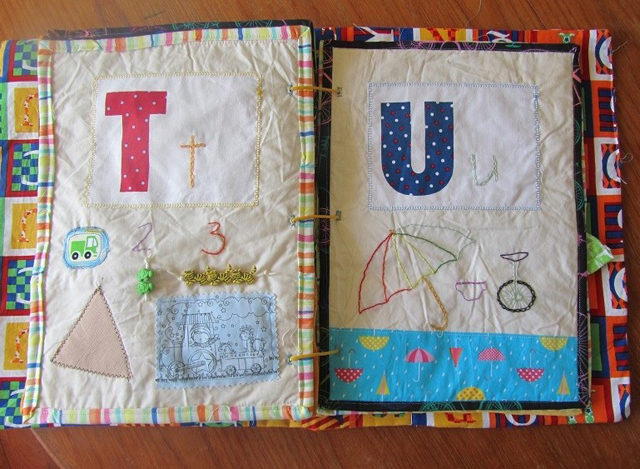 This book has so much cute embroidery - I love all the ideas Paula came up with for each letter! Please, enjoy! Paula! 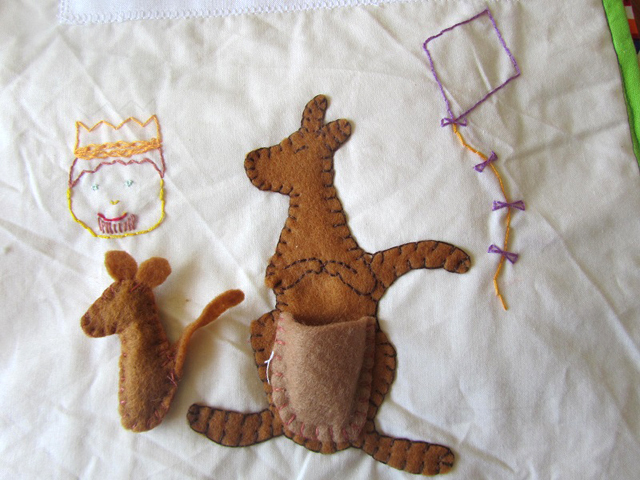 Stay at home mum, sewing nut, generally driven by the bizarre thought that I must be productive with everything I do. My girls who are two and a half and one. About four or five hours over six weeks. I was planning on it taking longer, but I put the pedal to the metal to get it done while my two year old was interested in learning letters. Nope. Everything came out of my head or from the scrap box and onto the page. The pages themselves are bedsheets that I recycled. 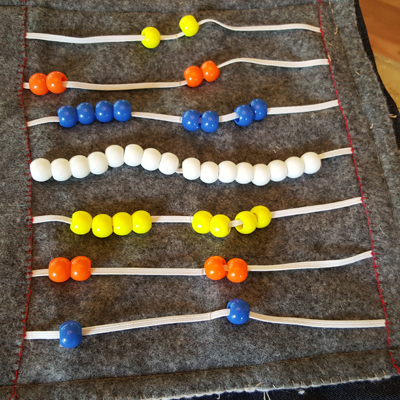 Felt, cotton, scraps of who knows what, drill, rubber table protector, buttons, velvet, beads, cords, zip. I aimed to make all of it from what I already had (hence cutting up the old bed sheet for the pages), but I did buy some of the fancy buttons and the ABC print fabrics too. Probably about $40.00 AUD all up. I love the C page for the simple reason that the car wheels turn. 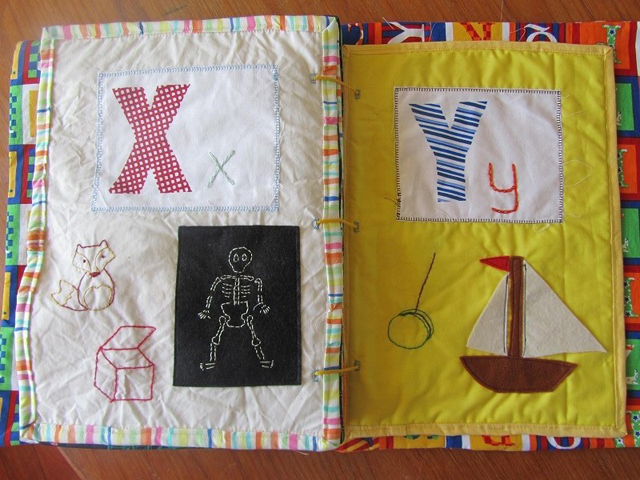 To see Paula's quiet book on her own blog (with more pictures of details and explanations), click here: Making it up as I go: ABC Book Breakdown. 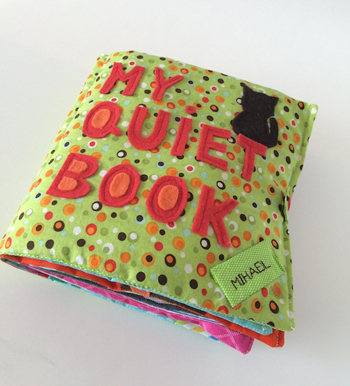 Paula, thank you so much for submitting your adorable quiet book! Today I get to share with you not one, but four quiet books! These were made by mom Renee, and I love how she did it. She used the templates available here, and instead of binding all the pages into one large book, she bound each two-page spread into it's own book. I love this idea because sometimes a big, full quiet book can be too bulky for wherever you're going - but two-page books like this could be perfect. 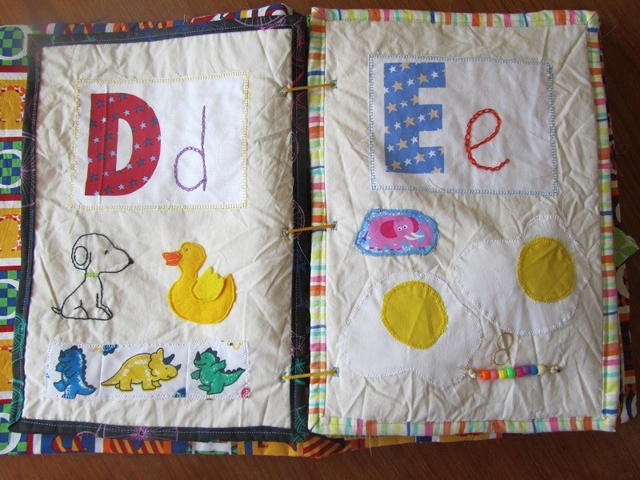 And I love the felt she used for the covers! 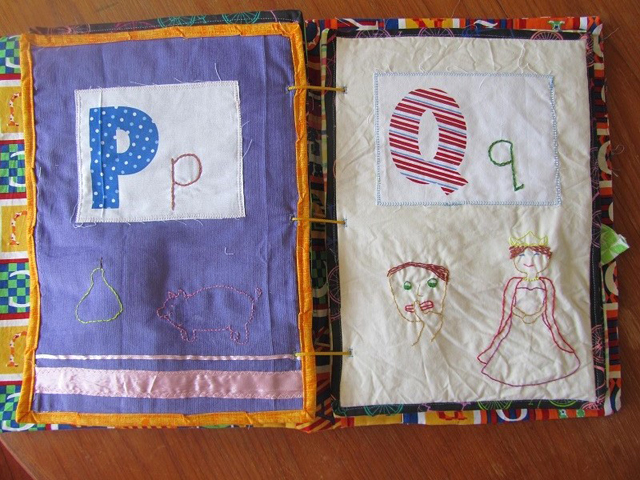 Renee, thank you so much for sharing your adorable quiet books! 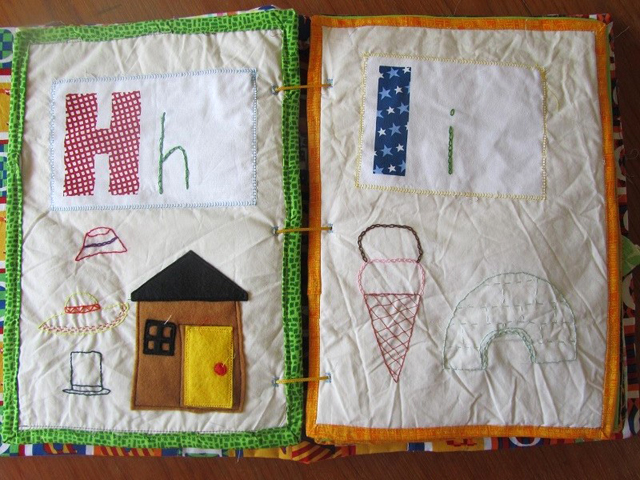 Today's adorable quiet book is made by the talented Lily from the blog Craft Learn & Play. 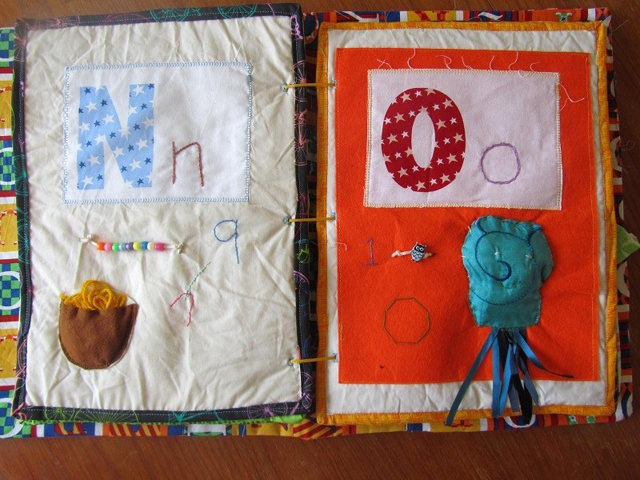 This is the first quiet book she made, for her nephew. 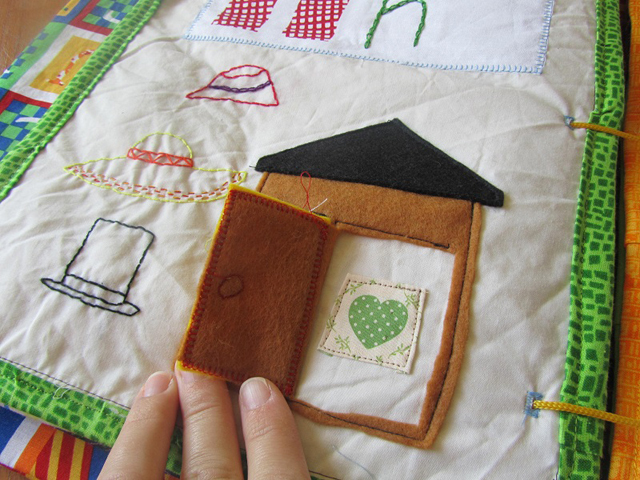 She now makes quiet books that are for sale in her Etsy shop. You can see the quiet books she has for sale here: Vivid Leaf: Quiet Books for Babies and Toddlers. 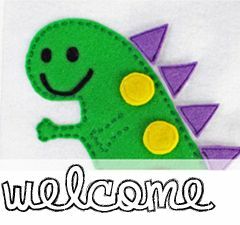 My name is Lily Zunic and I'm a first time mom who loves to create things; toys, games, decorations, accessories, food...well whatever I can think of. 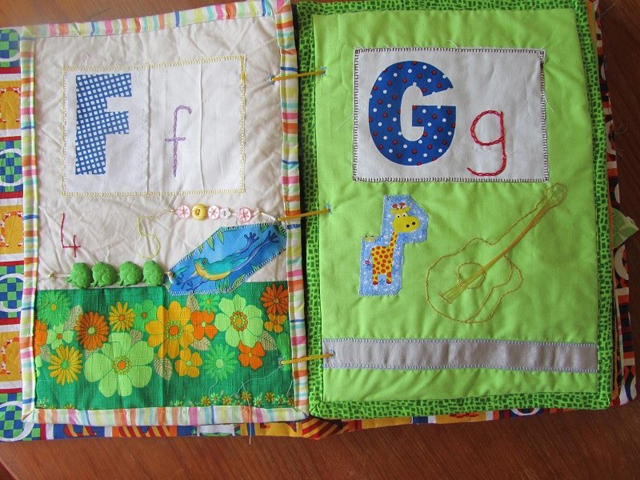 I've made this quiet book for my 2 year-old nephew who lives in Croatia. It was my first quiet book ever and had 16 pages in total. 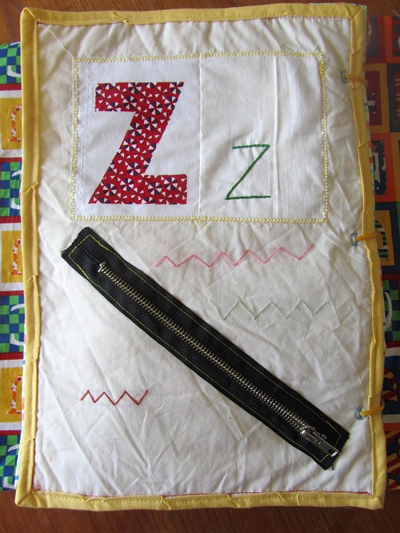 Although my grandma taught me to sew when I was a kid, and I had a sewing course many years ago I would say intermediate. It took me almost two months, not sure about hours. 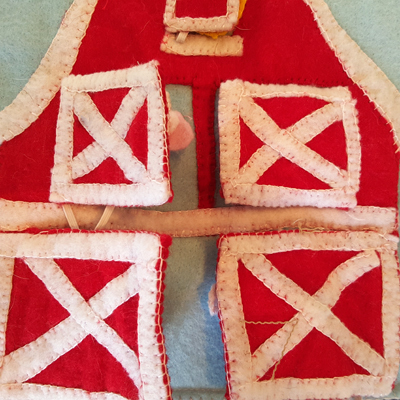 My baby girl was 5 months old at that time so I would sew whenever I had a little spare time. No, I didn't use any templates for that book, though I found many ideas on Pinterest. Whatever I make I like to cut shapes and tell the story on the go. It is part of the process and is much more fun. And not using templates makes my books different one from another. 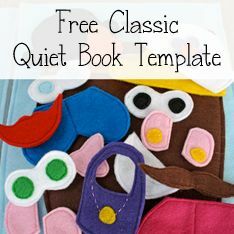 But on the other hand I started making free templates from my quiet books for moms who want to make their own quiet book. 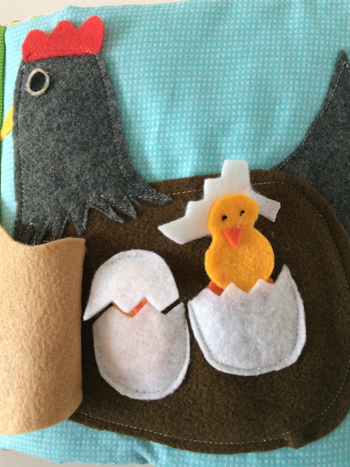 They can be found on my blog: Craft Learn and Play: Quiet Book Ideas - Mother Hen with Chicks. 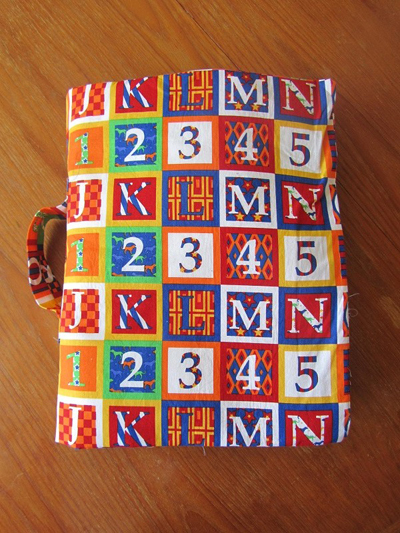 Pages are made of cotton fabric in different patterns and colours. Inside every page is batting to make pages thicker and soft to touch. 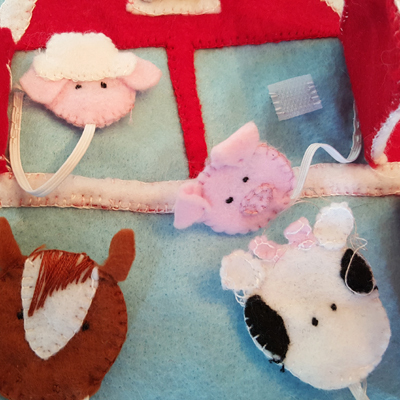 What other materials did you use?Besides cotton I’ve used felt, ribbons, velcro, KAM snaps, magnets, nuts and wooden stick (for fishing page), zipper, minky fabric, wooden beads, buttons and even photograph for tractor page. Mine favourite page is piggy bank. 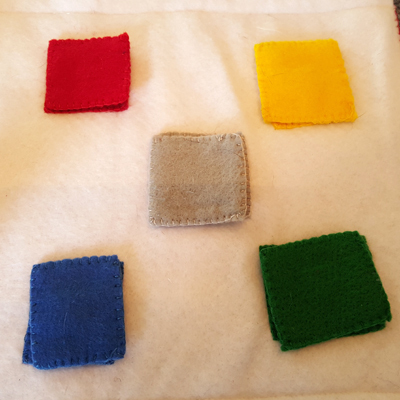 I’ve made secret pocket, that little project was going on for two days until I manage to sew it properly. But it works perfectly. Every coin you put in piggy bank falls down between pages into wallet. 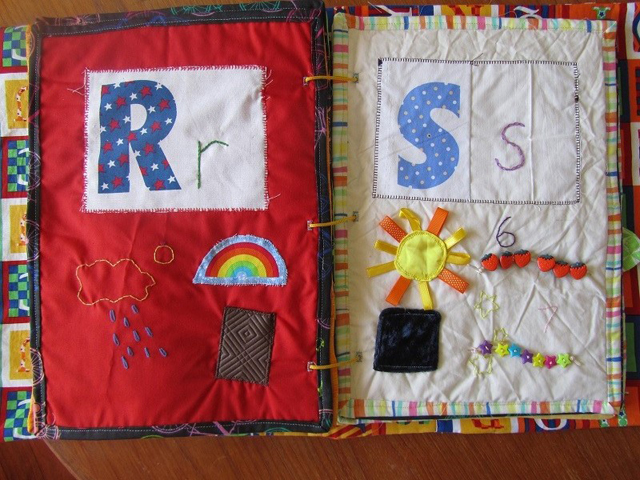 It is great page for practice fine motor skills and zipping. 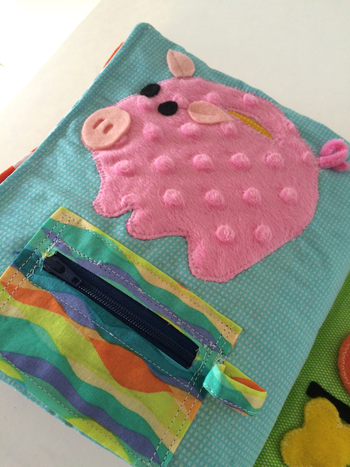 But I love the most soft piggy made of my favourite minky fabric. 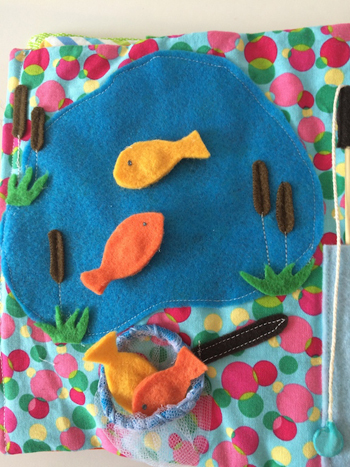 To see pictures of Lily's quiet book on her own blog (or to see more of her felt crafts), click here: Craft Learn & Play: Very Special Boys Themed Quiet Book. 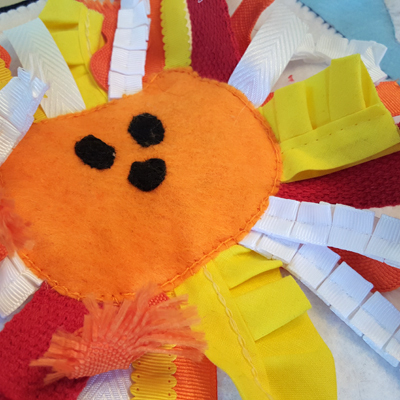 To see the quiet books Lily sells in her Etsy shop, click here: Vivid Leaf: Quiet Books for Babies and Toddlers. Lily, thank you for sharing your quiet book with us! 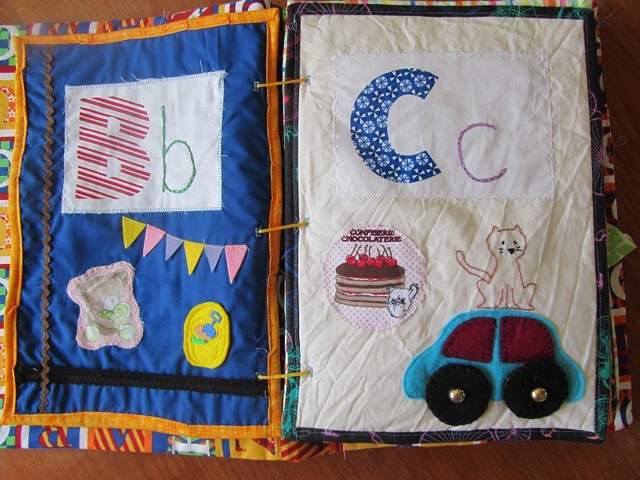 I’m Gramma to 2 boys, one is 2 years old, the other 5 months old, been sewing for 60 years. The above I think is original – maybe not but our baby loves trucks. We use shower curtain rings to change things up. What material are the pages made out of? What other materials did you use? Had a tiny bit of truck fabric left from making a pair of jammies. The rest is felt. 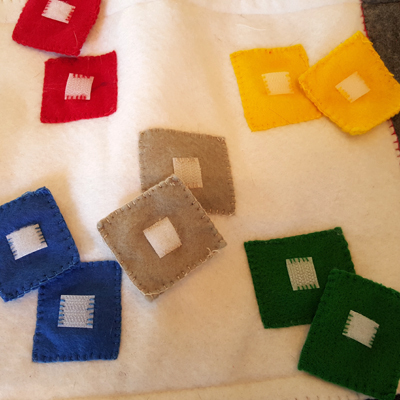 Edge is 2 layers of grosgrain ribbon which has a pattern of tools, poked 3 holes for shower curtain ring. Cost if purchased would be about $2. Joan's advice for making a quiet book is "Consider having a quiet book party. Share the fabrics, share the glue, share the laughs. Everyone bring 4 pieces of felt 4/$1 – one roll random ribbon $2 per roll, one small Elmer’s Glue $1, one bag Lorna Dunes (Those would be for me) $2. Total investment $6. And you should walk out with 4 pages each and a happy tummy." Thank you so much for sharing your quiet book pages with us, Joan!